Oh so yummy, pink on dark chocolate in a zipper pull...nice. I have to be careful and branch out and away from so much pink for cupcakes but I love it so. I have the best surprises coming soon in completely new, never seen before cupcake products from RockerJewlz! 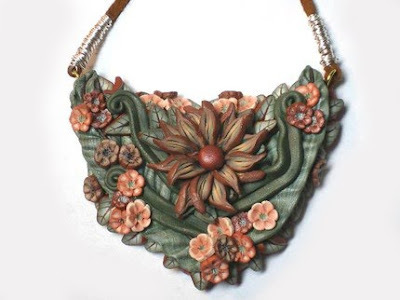 I'm excited that I can keep making new items for you, like these pulls. A lot of the beads in the new line will still be mostly combinations of in pink as my last group focusing heavily on that color. That way, those of you who want more color variety shall have it! I'm awaiting a whole slew of the beads, so I'll let you know when I'm getting close to releasing the new line! **Update: this beauty sold the day it was listed..woohoo!" Hi Everyone. Sorry I've been mia lately, but I've been busy working my little cupcake world so it's all good...now I have to tell YOU about it. So, how sweet is this cupcake truck? Literally! 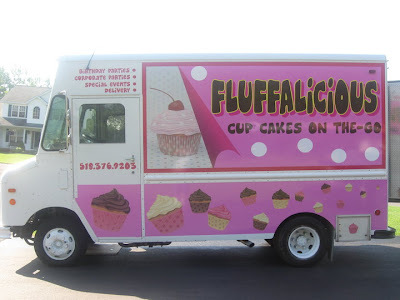 Fluffalicious debuted last week delivering fresh baked cupcakes to zillions of locations in the Albany (Colonie), New York area. You can stay posted via her Twitter account: @fluffycaketruck. Tina found my cupcakes via Facebook and just had to have a signature cupcake bead...which my friend Lezlie happily torched from lampwork glass. Look at the big cupcake on Tina's truck...now it's a cupcake bead in a necklace! One of her fans even ordered the bead as a cell phone charm on a pink cord. And now you can have one too since this Fluffalicious Signature Cupcake Bead is now available exclusively with RockerJewlz as a necklace, charm, zipper pull or cell phone charm. In other news, I have components on their way to me for an entirely new style of cupcake bracelet...and I have polka dot cupcake jewelry on the way as well! So stick close as I'll be posting them soon. Our little heat wave is gone from the San Francisco bay area now and we are do for a cold wet day tomorrow and then back to summer perfection. A bit of a roller coaster ride! Thanks for sticking with me in my long absences between posts! Hi...it's been a while, I know! I'm just finishing up some custom orders this week, so for now, I'll leave you with some pretty autumn beads and jewelry I've got in the shop. Enjoy! Good old Target had this wonderful cupcake folder with a matching notebook in the back to school section...in my favorite mix of pink, black & white...just couldn't pass it up! And look what I got on eBay! 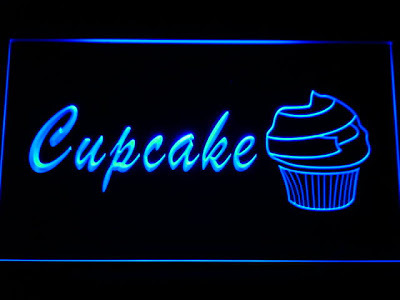 A neon sign etched with "cupcake" and a cupcake image. It only shows up as black for photo contrast. It really is clear plexiglass. I love the soft blue light that glows in front of me as I sit at my computer. Fun goodies! Did you find any cupcake goodies this week? Please include links! Mmmm, hmmmm. It's pumpkin time. And in the bead world that means getting ready NOW for Halloween and Autumn. 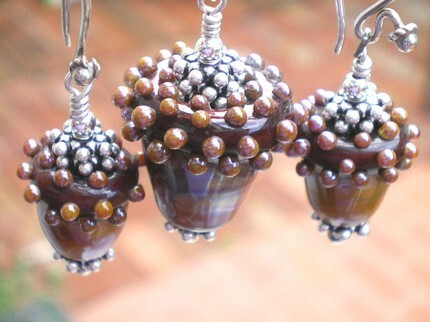 So as part of my destash, I've added lampwork beads crafted by the hands of independent U.S. artisans. This week I've got several styles of amazing pumpkins, a fabulous witch hat and coming up later, acorns...yep, in glass! Everything you need to make yummy items with elegant novelty beads....slurp!